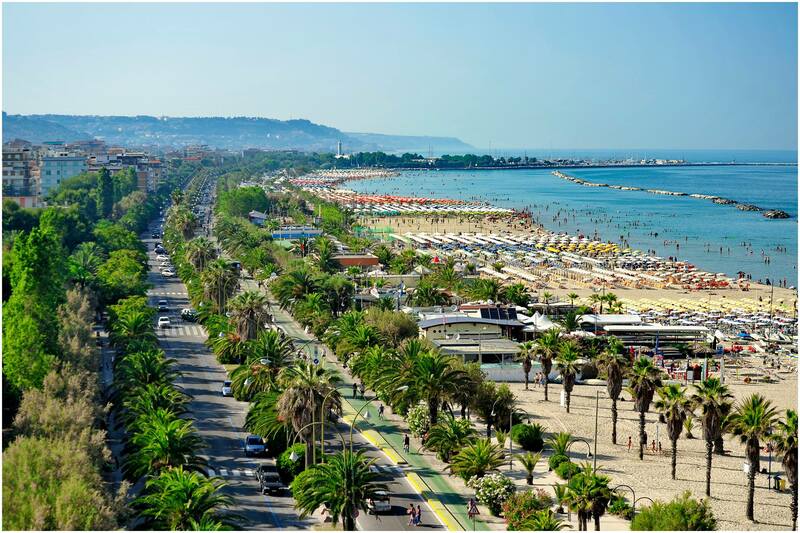 The southernmost stretch of the Marche Region coastline, from the town of Cupra Marittima to San Benedetto del Tronto, is known as “Riviera delle Palme” (the Palm Trees Riviera). The area’s peculiar climate has in fact allowed the growth of a thriving tropical vegetation, creating a unique scenery which contributed to an increase in tourism flows at the beginning of the 20th century. The beauty of its green areas, the fine white sand and a peaceful atmosphere have since attracted many visitors: today, the Riviera is one of the main tourist destinations in the Marche Region, with some of the highest figures both in terms of tourism flow and accommodation capacity. The charming historic districts of the towns of Cupra Marittima and Grottammare, overlooking the coast, are another good reason to visit the Riviera: history comes to life in the original medieval core of each town, which have undergone careful restoration in the last few years, while Art Nouveay villas, hotels and beach resorts, green gardens and tree-lined avenues define the most recent urban areas.